This is the first interview on Ciscozine and it is my pleasure and honor to introduce Anderson Mota Alves. With more 15 years of experience in the network consulting, he is a teacher in San Paulo university and have SEVEN CCIE!!! How do you combine study, work and personal life? During my study process combining these three things were one of the greatest difficulties I had to learn how to manage, because I had to spend so many hours of study after work and still save some time to attend to a few meetings with family and friends along the way. I knew from the beginning that if I could not keep a strict schedule plan of study, I would never get approved in any CCIE tracking at all. During this process I ended up moving away from some great friends because not being able to attend to most of the meetings I got invited to they kind of stop inviting me and I knew that my social life at that point was something important but definitely not the main objective of my plan. For every tracking I used to get the information of the topics from the blueprint and put in an spreadsheet numerating all of them and evaluating my level of confidence in each topic and then decided how many hours I would be committed during the week, usually something around 2-3 hours during weekdays and about 8-10 hours during weekends. Working so many hours made this plan a little bit harder than it should be, I remember back in the days that I used to felt asleep with my head on my notebook, and start policing me to not do that anymore after I broke up one of my notebook because of this habit of mine. My tablet also was one of my best friends during this process, remember I used to bring it with me to every place I used to go, even some beaches (in that case I used to swap to my kindle to minimize the glare of the sun so I could read it properly). Could you describe your daily routing as Cisco expert? I also visit customers with sales account trying to identify opportunities and even help the customers to plan the projects during the year and determine the necessary budget he will need to make the magic happens. Everyday I leave some time off to read the highlights of technical evolution and trends and when something really interests me I do a deep dive into that matter. When I leave the job now that I have more time free, three times in a week I used to go to the gym and when I get back home I’m spending sometime with my writing in a project of a technical book I’m willing to publish. The days I won’t go to the gym now I’m spending more time in the kitchen, cooking recently have been one of my new hobbies. And some Saturdays I teach two subjects in the network field (QoS and VPNs) in a post graduation course at university here in Sao Paulo. 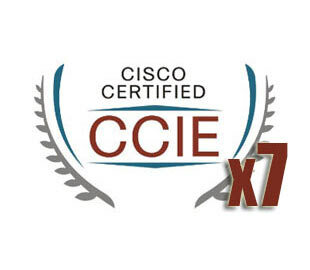 What is your secret to take seven CCIE certifications and why get seven CCIE? I usually quote a saying that is “no pain, no gain” and attribute the success of passing the exams with two words, focus and determination, they work like an inspiration for me. Like mentioned above it was not easy but at the same time it was a pleasurable experience, no doubt about it. I started my career working with servers and then I realized that network was what I really wanted to work with, the idea of transferring huge files among cable really got me fascinated and I used to dream of being a CCIE one day. Remember that some colleagues at work or even some members of my family used to say that I would never be able to pass an exam like that, and I guess that those critics really worked for me in a good way, every time I thought to give up during my first CCIE I remembered what some people used to say to me and would like to prove to me that I was worth it, after the first CCIE I guess that I was thirsty for knowledge and never really stopped after my first exam. Today being able to discuss and design robust projects and start mixing different technologies without losing resiliency really make a difference. Some people think that they deserve an increase of their salary after each tracking of CCIE they manage to pass, but unfortunately that thing won’t happen, after the first CCIE I did it because I really enjoyed myself during the learning process, of course having more than one CCIE can excels you from the others and you will be able to choose to which projects you would like to work with, but that’s all in my opinion. Are you able to follow the technologies news at the same time? Everyday I use to read the highlights of the technologies I’m following at the moment, and when I see something that really interest in I try to learn more about it with not only reading but seminars and practical labs. I also download most of the contents I read from Cisco Live 365 and from time to time I read technical contents from blogs, now Ciscozine being one of them. What improvements in Cisco Technology would you suggest? The first reason back in the old days I had chosen Cisco as the networking company I would like to learn, it was not only because of their respectful certification program at that moment, but because they were not only careful in teaching you how to configure their equipment, but also were interested in teaching the technology. They definitely contributed to the networking area in a way that all their competitors now respect and look for Cisco certified persons to work in their companies. We know that we have a lot of people that wants the reward and better salary that comes with the certification, but not all of them are willing to pay the price of long journey of study to accomplish that. CCIE has its prestigious and is respected in the area because even if you can get some information of how the exam is developed, you still would need a lot of experience and hands-on to pass the exam. For CCNA and CCNP certifications I think they can ask more practical questions where people needs to solve problem or complete sequence of configuration so that would incentive people to lab more the topics they are studying and that would be better for the program. CCAr is the highest level of certification someone could dream of and I really admire people that managed to accomplish it, but at moment that is not one of my priorities in life because that would definitely require almost 2 years to properly study for it. I think that now it’s time for me to give back some of my knowledge to the community and people that is starting in this area, so I’m planning to start with some local seminars and people can bring non-perishable food as entrance so we can donate it later to institutes. And now, after seven CCIE certifications, what is your next goal? At moment I’m trying to get back to things I used to love before this 10 years’ journey of intense study, things like bicycling, jogging, travel to exotic beaches around the world, waterfalls being one of my weak points (really like it), and now I’m cooking different dishes which I’m loving it. I also have the plan to publish some technical guide materials written in Portuguese to help the young guys that are willing to start working with network field. I would like to thank Anderson once more for the time dedicated to me!